Of course you’ll find all the expected favorites here like Ravelry, Knitter’s Review and Knitty, but you’ll also find some fun stuff you might not have known about, like KnitMap, an online database of knitting stores; and Yarndex, which is one of my favorite places to go to find more information about different kinds of yarn. Speaking of, I’d love to hear what some of your favorite knitting resources online are! 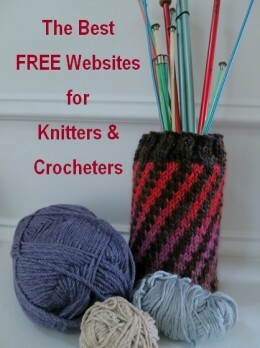 Hi Sarah – I love all the knitting info that you post on CraftGossip!! Thanks so much for posting the information and link to my article! I appreciate it! And I’d love to hear if your readers know of other websites that should be added. Thanks! !